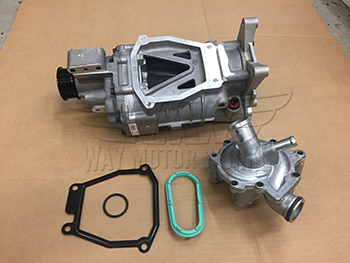 Supercharger Replacement Package for 2002-2006 R53 Cooper S, and 2005-2008 Cabrio S. If you have had the supercharger fail and stop turning the water pump this is a complete kit to replace everything you need. 1 New OEM MINI Eaton John Cooper Works supercharger for R52, R53 MINI Cooper S 02-06. Supercharger will come with pulley of your choice installed stock, 15%,16%,or 17%. If you have a noisy supercharger or low boost you may have a faulty supercharger. As the R53 Cooper S gets older and the supercharger ages with miles we have seen these fail. The most common failure is the water pump drive. When it fails the water pump stops and the car overheats. Don't overpay at your dealer. 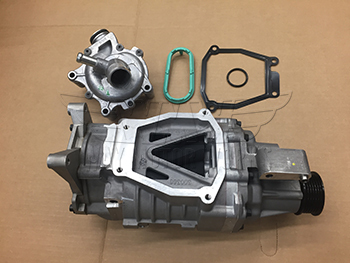 This is a Brand New Supercharger unit from MINI, not a rebuilt unit from some aftermarket company.